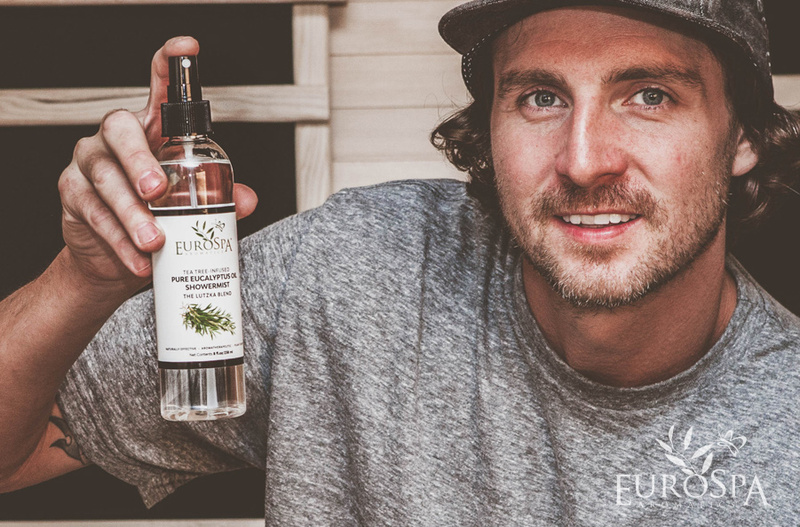 Earlier this year we sat down for a chat with Greg Lutzka, pro skateboarding, two-time X-Games Gold Medallist, and eucalyptus oil enthusiast, to find out about why he wanted his own ShowerMist scent and how he incorporates it into his healthy lifestyle routine. He also admitted that he loves our Lavender-Infused ShowerMist to help him sleep better at night. He sprays it all over his bedroom at bedtime to quickly help him get much-needed shut-eye. Using our Pure Eucalyptus Oil ShowerMists is just one of the elements in Greg’s healthy lifestyle. Skateboarders usually aren’t known for their healthy living — Greg wants to change this and inspire the next generation of skateboarders to take care of themselves as top athletes do. The party lifestyle starting hitting him hard at 28, and he quickly realized going out and drinking was affecting his skate performance. “I want to feel good and skate well and the only way to do that is to eat well and take care of my body. I also got into yoga, which I never thought I would do. Hot yoga is like stretching in a sauna, and stretching with heat helps tremendously with my skating. Plus I’m forced to drink more water and less soda. I firmly believe it’s so important to drink water, and I love drinking water so much that I partnered with AQUAhydrate and now I’m a part owner in the brand.” When he does drink soda, it’s only the all-natural stuff with no high-fructose corn syrup, like Zevia. Greg starts the day by stretching, followed by a protein shake to build muscle and stay lean, or a Sambazon açaí bowl filled with fresh fruit (like berries and bananas) and hemp for fuel before a workout. Sometimes when he’s busy, he’ll grab a bowl from Banzai Bowls, who will make an açaí bowl or smoothie to-order. He then works out in his own home gym, which is conveniently located next to his infrared sauna. The gym he built for himself in his house includes a stationary bike, multi-exercise weight machine, and mats for stretching. One of Greg’s favorite places to have lunch is Sessions West Coast Deli, which has three locations in Orange County. Greg is part owner in the restaurant, which will be opening another location in Newport Beach around Christmas. Sessions offers food that’s antibiotic-free, all-natural, vegetarian fed, animal by-product free, gluten-free, dairy-free, soy-free, MSG-free and nitrite-free. Greg’s favorites are chicken or turkey sandwiches that have both high-quality antibiotic-free meat and organic veggies. Sessions sandwiches are served with salad as well, so Greg knows he’s getting his greens in for optimal nutrition. For dinner, Greg admits he’s not the greatest cook but he still eats healthy to ensure maximum performance and to keep his head in the game during competition. When he eats at home, he’ll invite friends over for a barbeque, where he’ll grill steak, chicken, or turkey burgers with veggies like asparagus, potatoes, or corn. Other nights, he’ll steam broccoli and carrots and add it to pasta with non-dairy alfredo sauce from Mother’s Market, then throw in some chicken for lean protein. Greg’s current go-to home-cooked meal is a stir-fry with lots of veggies and chicken and jasmine rice. When he doesn’t cook, he opts for quick and healthy meal services like Freshly, who offer chef-cooked meals delivered to your door so you can skip the meal-prepping, cooking and cleaning. Freshly uses only high-quality all-natural ingredients, without artificial preservatives, added sugars or gluten. Greg recently discovered the benefits of using hemp oil and CBD to promote relaxation and help the body heal after a friend introduced him to it. “I started taking CBD oil drops for relaxation and recovery. I use the CBD creams for injuries from skateboarding.” Cannabidiol —CBD — is a natural part of the hemp plant that has been shown to have positive health benefits, without causing psychoactive effects. CBD is a cannabis compound that has significant medical benefits, but doesn’t make people feel “stoned” and can actually counteract the psychoactivity of THC. Scientific and clinical research has shown CBD’s potential as a treatment for a wide range of conditions, including: arthritis, diabetes, alcoholism, MS, chronic pain, schizophrenia, PTSD, depression, antibiotic-resistant infections, epilepsy, and other neurological disorders. CBD is also extremely effective for alleviating pain and inflammation without any of the side-effects that you’d normally find in prescription pharmaceuticals and over-the-counter pain drugs. Greg recently partnered with Crafted Extracts Co. for a line of CBD and THC products that include two pain relief balms, three strengths of CBD Herbal Drops, and four flavors of oil cartridges designed to ease anxiety and promote relaxation. Who wants to try these high quality THC & CBD products ??? I’m Stoked to announce I partnered with @craftedglobal launching a whole line of THC & CBD Pens, Creams & Drops !!! Can’t wait for these to hit the stores and sell online. 🔥 🔥 🔥 Leave a comment !!! If you’d like to try the Tea Tree-Infused Eucalyptus Oil ShowerMist that we developed with Greg, check it out in our store. For more information on how it can be part of your healthy lifestyle, check out our Tea Tree product page. You can follow Greg Lutzka on Instagram, Twitter, Facebook and YouTube.